Words cannot express the awesomeness of this hack. Whats an ‘analog switch’ in this context? equivalent to a transistor or mosfet? Are ‘analog switch’ ICs bidirectional? as in they can have the signal/switch pins biased in either direction? Yes. They act very much like a (high resistance) mechanical switch, as long as the voltages are within its rails. 1) When off, current can still flow in reverse through it, through the “body diode” (a side effect of how MOSFETs are made, that acts like a separate diode in anti-parallel). 2) Let’s say you have a single N-channel MOSFET. To turn it on, the gate must be some volts lower than the channel voltage. So assuming you don’t want to bother with a negative power supply and can only go as low as 0V on the gate, then the minimum voltage you can switch is limited to a few volts higher. With many MOSFETs, you couldn’t switch a 2V analog signal, for example. This shows the body diodes as separate components. 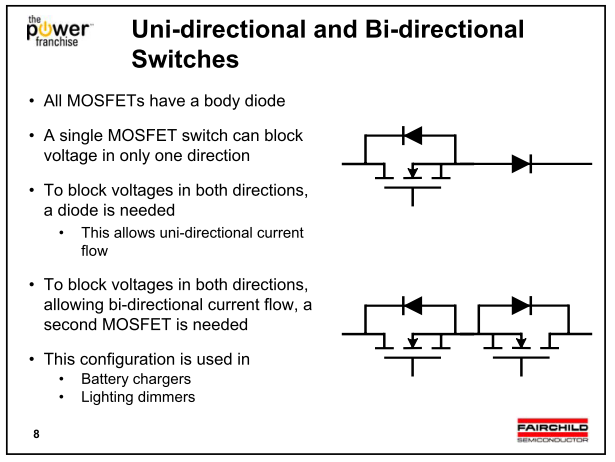 Try imagining how current flows in either direction when both MOSFETs are on, or is blocked when both are off. I would guess “analog switch” in this context probably refers to something like the 74hc(t)4066. But I could be wrong as I haven’t watched the video. Reply fail, I meant to reply to the post by “Tom D’Netto”. I guess what Im trying to ask is what the function (in general) of an analog switch is. A quick fl;ick through the datasheet doesnt clear it up for me. If a Control-Pin is high, the two Analog-Pins have a low-resistance connection. If a Control-Pin is low, the two Analog-Pins have a high-resistance connection. This works over a more-or-less big range of voltages and currents in both directions. It functions just like a physical switch. Or more specifically, like a relay. They all have their own characteristics forthings like On and Off resistance, maximum voltage, switching times etc. Thanks for all the pointers guys! Just ordered a bunch from element14 to play with. er…. Wasn’t the 626 the Latin percussion version of the 606, rather than a later model? 626 was latin percussion, but also digital like the 505 and 707. 606 was all analog signal generation like the 808. Hello, owner of a 626 and 707 here, former owner of a 606. TR-606 is an all-analogue design (for the voice circuits). TR-727 is a 707 with Latin percussion samples. TR-626 has both rock and Latin samples. There are a number of other differences between the machines. Calling the 626 “a slightly more modern version of the TR-606” is not particularly accurate. And dragging the 303 into the mess is really reaching.